Structure of AWT contains many components that are to be placed in GUI interface. 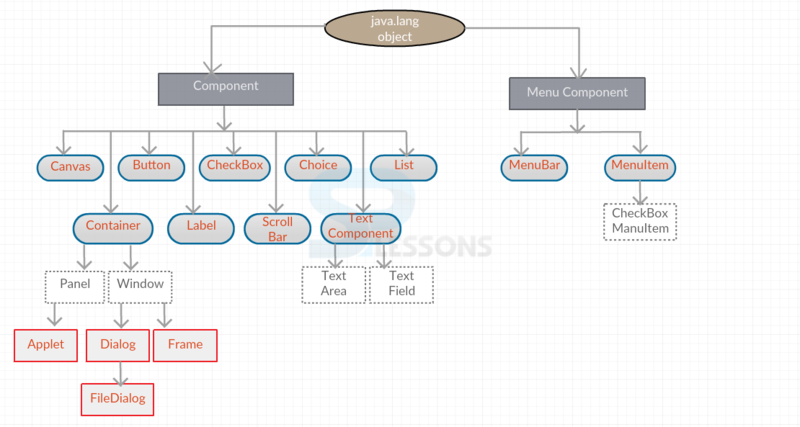 A java object has components and menu components. Components play a key role by providing Canvas, Buttons, Checkboxes, Choices, List, Scroll bar, TextComponent and Container. The TextComponent consists of textfield and textarea. The Container is further divided into 4 main parts: Window, Frame, Panel, and Dialog. All the applets are maintained and developed in a container. MenuComponent will have MenuBar and MenuItem, which is further divided into CheckBoxMenuItem. Component An object can be displayed on screen, interact with the user, and has graphical representation. Container An ordered list of components is a container. Panel The space provided for components by the application is called as a panel. That space can also be acquired by other panels too. Window The screen area on the desktop displaying the data and performing the operations specified is called as a window. Frame A high-level window with corners, titles, menus, and borders is called as a frame. Canvas Canvas is a blank area, which displays an application and receives the input in the form of events. All the components built are placed in containers to get a required layout. All the layouts are managed by the layout manager and gives directions while arranging the components to get the desired output. 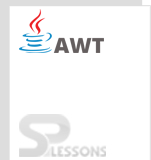 Components and Containers are the key concepts in forming the structure of AWT. Layouts are formed by the combination of components.